Whether you have a legacy lift or a brand new installation, ongoing maintenance is key to ensuring optimum passenger experience, health and safety, and your annual budget line. At Tower Lifts our goal is always to maximise the return on investment businesses make in their vertical transport. A tailored maintenance package is one of the ways we manage it. When creating a maintenance agreement with businesses, Tower Lift engineers create a bespoke package based on the age of the lift, the usage, the function and the maintenance and repair history. We also take into account the business context; if there are long-term plans to replace the lift, or to modernise components, we’ll factor this in to the scheduling. We take great pride in the professional network of lift engineers we work with across the UK. Each one of them is a skilled engineer maintaining the highest standards for lift maintenance. Our tailored maintenance packages draw on a range of services we’re now able to offer UK-wide. If you need a lift maintenance package that is tailored to your business, and your budget, call us today on 01525 601099 to talk through your requirements. Whilst passenger lift maintenance minimises the potential for lift breakdown, the possibility can never be removed completely. That’s why it’s important to partner with trusted lift maintenance contractors who will make engineers available when you need them, arrive promptly, and make the necessary repairs to have the lift up and running again as soon as it’s possible to do so. If you have a platform lift, or a lift providing access to passengers with limited mobility, your maintenance package will need to take into account the ongoing compliance requirements. Our wheelchair lift maintenance can integrate ongoing improvements in the form of handrails, or a waist-high control panel. These can be scheduled in to align with ongoing budget availability. Professional lift maintenance is key to your business, so you need a supplier you can trust. 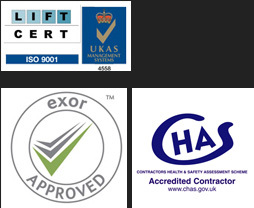 Tower Lifts is a CHAS Accredited Contractor, and a leading UK provider of bespoke lifts, and lift services. Our lifts can be found in schools, homes, shopping centres, public buildings and office blocks and hotels. Every designer, installer, and maintenance engineer we work with is guaranteed to provide the same high level of service we have always offered to our clients.